The club provides a wheelchair loan service to anyone in the community that has a short term need for one. There is no charge for the loan although a £10 refundable deposit is required. This facility is used by both young and old alike and has proved to be a very much appreciated service (especially by our “caravanners” and visitors in the summer season). 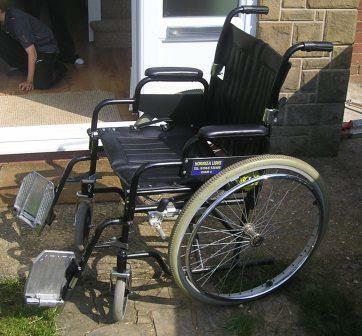 Until recently, all of the wheelchairs that we owned had been donated by local people. Some of these required a considerable amount of repair and maintenance. It was decided in 2007 to purchase 6 brand new wheelchairs to ensure that when they were loaned out, we could be happy in the knowledge that they were safe, in good condition and met all the stringent legal requirements of the Health and Safety Executive and Trading Standard regulations. Such has been the success of the service that in 2009 we have purchased six more to help meet demand. These plus donations from the public mean that we now have 36 wheelchairs in use and they are out on loan most days - so book in advance!! If you wish to borrow a wheelchair, remember that they are popular!! Please, book it in advance by visiting or 'phoning the Lions Shop on 01964 536400. 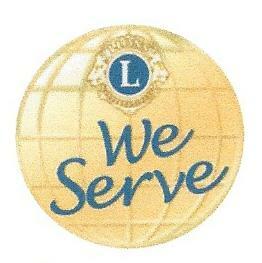 Or Contact Lion David Spensley or further details. Wheelchairs can only be checked over and issued by the Lion on duty in the shop, who will wish to see evidence of identity for the borrower and collect information to book the wheelchair out. The loan period is now 10 weeks and then the wheelchair must be returned to the Lions Shop for safety checks. We now have available a limited number of walkers and "Zimmer" frames which may be kept on a long loan term. Walking Sticks and Crutches have also been donated and may be purchased at a very reasonable price. Please ask the staff on duty in the shop for details of what is available. Customers loaning Wheelchairs/walking aids owned by Hornsea District Lions Club. (HDLC) must accept the Clubs Terms and Conditions of use. The wheelchair/aid is loaned from the “Available for use bay” at HDLC shop. That it is loaned on refundable Deposit of £10-00, for a period of up to 10 weeks (unless it is expressly noted and agreed on Part A of the loan Form). That the Customers Name and address is verified and that a Contactable Telephone number is left on loan Form. That the loan of the wheelchair is not transferable. That Wheelchairs/aids are loaned and used at Customers own risk. 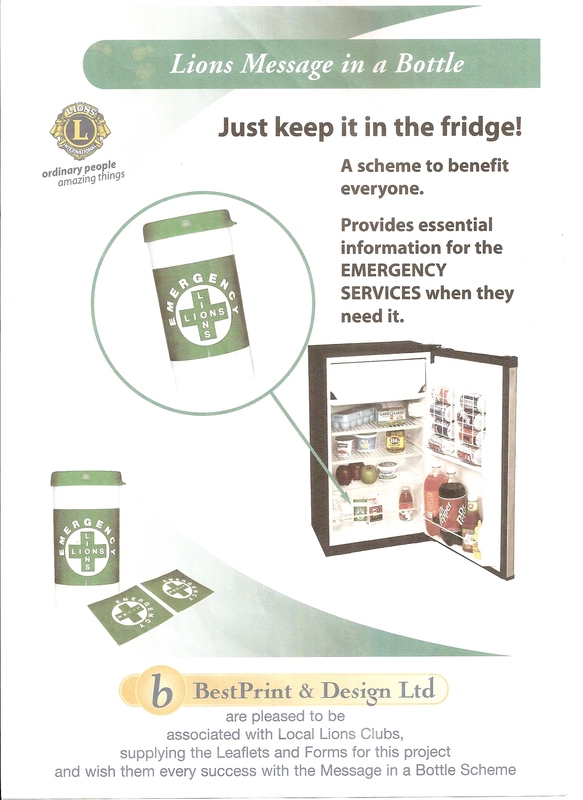 That it is checked by the customer before each use, and that it continues to be safe and practicable for that use. That the Wheelchair/Walking Aid is returned to the Lions Shop at the end of the 10 weeks period for inspection and repair.If the item is found to be in satisfactory condition the loan can then be continued for further 10 weeks at no extra charge. That the customer must take all means practicable to clean and care for the wheelchair during its normal use and provide safe, weatherproof storage. That if damaged during use, this is reported and returned as soon as practicable to HDLC for repair/replacement. Minor damage (puncture, loose nuts etc.) is not normally charged for. Any Major damage the HDLC reserves the right to retain the deposit to assist in defraying the costs of the repair. Terms and conditions are subject to change at short notice; by the HDLC any significant change the loaner will be advised. Should the customer default against these terms and conditions, HDLC reserve the right to recover the wheelchair or its value at the customers’ expense. £10-00 Refundable deposit (see terms and conditions above) secures a loan of a wheelchair. the other on the door of your fridge. Please fill in the form found in the container. eg. Who has a front door key or can look after the pet should you need to be taken to hospital. THESE INSTRUCTIONS SHOULD BE UPDATED REGULARLY. 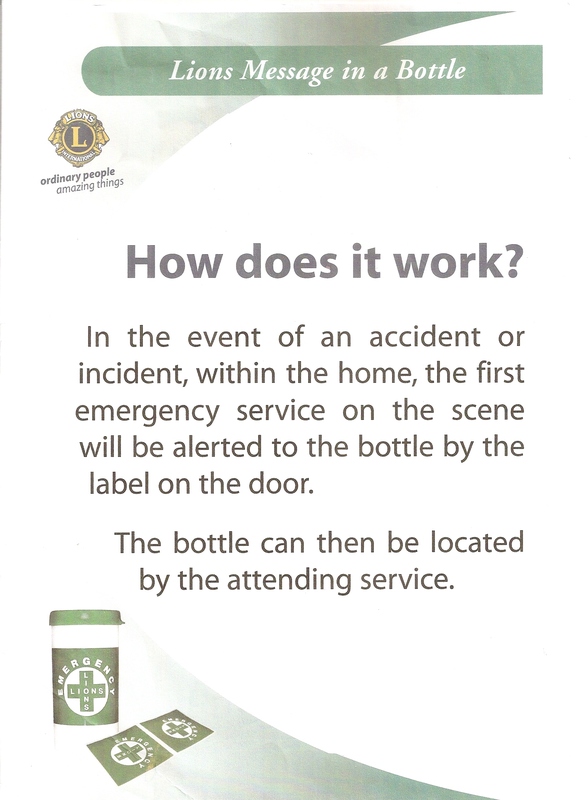 Put the “bottle into your fridge door- this is where the emergency services will locate it. These are situations where the “bottle” can “speak” for you. 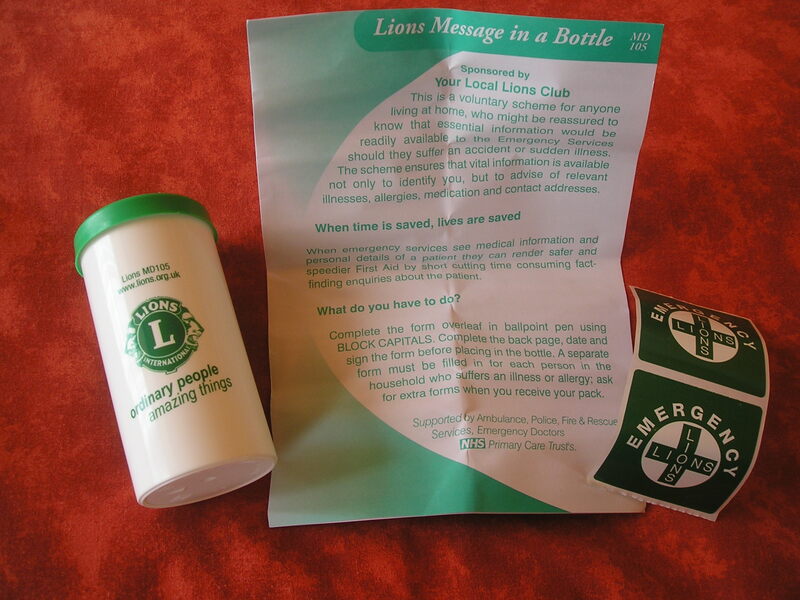 The message bottle can then be located by the attending service. The response team will then who you are,know what medications you may be on and act accordingly. Know who and how to alert next of kin. And should you need to be hospitalised this info. can be given directly to them. We hope that the “bottles” are never opened but it does give you peace of mind. Dental surgery.Chemist and Jamie Goodlass hairdressers. To-day Store, The Post Office. Lloyds Chemist, Pentecostal Church second-hand shop. & Not Forgetting The Lions Shop here in Hornsea!